Britain was once the most powerful nation in the world. It ruled a wide-reaching empire. This week in our series, we look at how British power gave way to American influence after World War Two. One can almost name the day when this happened. It was February twenty-first, nineteen forty-seven. British diplomats in Washington called the State Department. They had two messages from their government. The first was about Greece. The situation there was critical. Greece had been occupied by Germany during the war. Now it was split by a bitter civil war. On one side of the fighting was the Greek royal family supported by Britain. On the other side were communist-led rebels supported by Yugoslavia and the Soviet Union. British forces had helped keep Greece from becoming communist at the end of World War Two. A few years later, Britain could no longer help. It needed all its strength to rebuild after the war. So, on that February day in nineteen forty-seven, Britain told the United States it would soon end all support for Greece. Britain's second message that day was about Turkey. Turkey was stronger than Greece. But the concern was that it, too, could become communist unless it received outside help. Britain warned the United States that the Soviet Union would soon extend its control all the way across eastern Europe to the eastern Mediterranean. It called on President Harry Truman to provide strong American support to help Greece and Turkey resist the communist threat. Britain, in effect, was asking the United States to take over leadership of the Western world. The United States was ready to accept this new responsibility. For months, relations between the United States and the Soviet Union had been growing worse and worse. The two countries had fought together as allies in the Second World War. But Soviet actions after the war shocked the American people. The Soviet Union wanted to block western political and economic influence in central and eastern Europe. It wanted to extend its own influence instead. So, after the war, it forced a number of countries to establish communist governments. Britain's prime minister, Winston Churchill, described the situation in a speech in March of nineteen forty-six at Westminster College in the American state of Missouri. 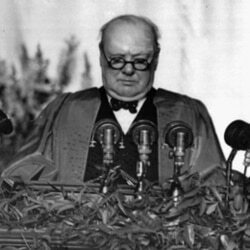 Churchill warned that the Soviet Union was trying to expand its power. He described it as an "iron curtain" falling across the middle of Europe. This iron curtain divided Europe into a communist east and a democratic west. The situation was made even more tense by news coming from China. China was a divided nation at the end of World War Two. The forces of Nationalist leader Chiang Kai-shek controlled the southwestern part of the country. Communist forces under Mao Zedong controlled the north. Both the United States and the Soviet Union expected that Chiang Kai-shek would be able to unite China. Chiang and the Nationalists won several early victories over the Communists. But Mao and his forces used a growing hatred of the Nationalist government to win support. Slowly, they began to win battles and capture arms. Early in nineteen forty-nine, communist forces took control of Peking -- now Beijing -- and Tientsin. They captured Shanghai and Canton. By the end of the year, Chiang and his Nationalist forces had to flee to the island of Taiwan. The fall of the Nationalist government on the mainland caused a bitter political debate in America. Some critics of the Truman administration thought the United States had not done enough to help the Nationalists. "The unfortunate but inescapable fact is that the ominous result of the civil war in China was beyond the control of the government of the United States. Nothing that this country did or could have done within the reasonable limits of its capabilities could have changed that result; nothing that was left undone by this country has contributed to it. It was the product of internal Chinese forces, forces which this country tried to influence but could not. A decision was arrived at within China, if only a decision by default." The United States was more successful in its policies toward Europe. The British warnings about the communist threat in Greece and Turkey led President Truman to speak to Congress. He said, "I believe that it must be the policy of the United States to support free peoples who are resisting attempted subjugation by armed minorities or by outside pressures." Truman called on Congress to give him four hundred million dollars in aid for Greece and Turkey. After a brief but intense national debate, Congress agreed. Truman then launched an effort to save the Greek economy and reorganize the Greek army. Soon after that, Yugoslavia and the Soviet Union ended their aid to Greek rebels. The civil war in Greece ended. American help for Greece and Turkey was the first step in what became known as the "Truman Doctrine." The goal of this policy was to stop Soviet aggression anywhere in the world. Truman was willing to use military force to stop the spread of communism. But he also believed it was equally important to build up western European nations so they would be strong enough to defend themselves. Europe was suffering terribly after World War Two. 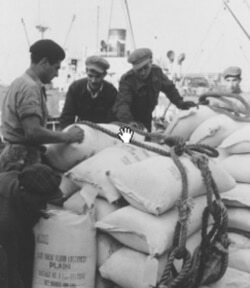 There were severe shortages of food and fuel. Crops were destroyed. Many Europeans were beginning to look to the communists -- to anybody -- to save them. This is one reason why Truman and his advisers developed a plan to rebuild the economies of Europe. After the war, President Truman made George Marshall his secretary of state. Marshall had led American troops as a general in World War Two. Now, as the nation's top diplomat, he proposed the idea for rebuilding Europe. This idea became known as the "Marshall Plan." President Truman explained why there had to be a Marshall Plan. People were starving, he said. There had been food riots in France and Italy. There was not enough fuel. People were cold and sick. Tuberculosis was breaking out. As Truman said later, "Something had to be done." Secretary of State Marshall described the plan during a congressional hearing in Washington. GEORGE MARSHALL: “Why must the United States carry so great a load in helping Europe? The answer is simple. The United States is the only country in the world today which has the economic power and productivity to furnish the needed assistance. The six and eight-tenths billion proposed for the first fifteen months is less than a single month’s charge of the war. To be quite clear, this unprecedented endeavor of the new world to help the old is neither sure nor easy. It is a calculated risk. It is a difficult program. And you know, far better than I do, the political difficulties involved in this program. 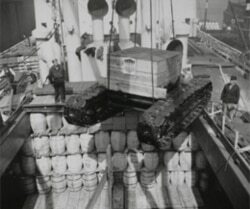 The United States offered aid through the Marshall Plan to all countries in Europe. The Soviet Union and its allies refused help. Sixteen other countries, however, welcomed the aid. From nineteen forty-eight to nineteen fifty-two, administrators of the Marshall Plan worked with these countries. The United States spent thirteen billion dollars. The plan worked. Agricultural production in Marshall Plan countries increased by ten percent. Industrial production increased by thirty-five percent. Production in some industries, such as steel, increased by much more. There were political results, as well. Stronger economies helped prevent communists from gaining control of the governments in France and Italy. Some Europeans criticized the Marshall Plan. They said it increased tensions between the United States and the Soviet Union in the years after the war. Yet few could deny that the plan was one of the most successful international economic programs in history. Next week, we look at another way the United States provided aid in postwar Europe -- the Berlin Airlift. This was program #200. For earlier programs, type "Making of a Nation" in quotation marks in the search box at the top of the page.